Monday’s session was a rare reunion of Lotte’s 94-year-old founder Shin Kyuk-ho and his three oldest children. His two sons fought a public battle over control of the company, while his daughter is currently in prison. The four were indicted in October 2016 on a range of charges including embezzlement, tax evasion and fraud. The trial is significant because South Korea’s family-controlled conglomerates, or “chaebols”, used to be considered untouchable given they have powered much of the country’s economic growth. But in recent years, the chaebols and their family members have become the focus of public anger over inequality and corruption. The corruption trial is separate from the investigation facing former South Korean President Park Geun-hye over her alleged dealings with other big conglomerates, including the Samsung Group. The first day of the Lotte trial was a dramatic one. Here is the background. In a packed courtroom on Monday, nonagenarian patriarch Shin Kyuk-ho showed his displeasure at being called to court. “Lotte is a company that I made, I have 100% of the shares, who indicted me?” the 94-year-old reportedly shouted before throwing his cane on the floor. The judge had to ask the Lotte Group founder to be quiet. Mr Shin is said to suffer from dementia, according to a local media report citing his eldest son. 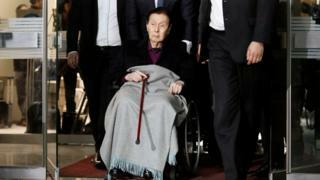 News agencies said he appeared confused as he entered court in a wheelchair. Mr Shin ceded control of the Lotte business empire, which spans hotels to department stores, after being ousted by his younger son in 2015. Shin Kyuk-ho has been indicted for tax evasion, embezzlement and breach of trust, but his lawyer said he denied all charges. The Shin family first came under investigation after a feud between Shin Dong-Joo, 63, and his younger brother erupted into public view. Shin Dong-Joo, the eldest son of Lotte’s founder, had been considered the heir apparent but was usurped by his younger brother who had successfully expanded the brand. He subsequently attempted a failed boardroom coup last year. The bitter battle between the two brothers triggered investigations into the Lotte Group, which led to 22 people – including the four family members – being indicted by prosecutors. Younger son and Lotte Group Chairman Shin Dong-bin, 62, is accused of embezzlement and breach of fiduciary duty. This includes alleged tax evasion, financial scams and irregular payments to family members. His lawyer said the payments in question were organised by his father without Shin Dong-bin’s involvement, according to Reuters. The Lotte Group has said most of the allegations aren’t directly linked to him as they involve events during the time his father was in charge. Shin Young-ja has been sitting behind bars since last July. She was sentenced to three years in jail in January for embezzlement and breach of trust. Formerly the head of Lotte Shopping, Shin Young-ja has resigned from both the company and her other board posts. Lotte, which is South Korea’s fifth-biggest conglomerate, isn’t just facing a tough time in court. Around 80% of its stores have been shut in China as part of the backlash against a US missile defence system being deployed in South Korea. The firm had provided land to host the Terminal High Altitude Defense (Thaad) system, which the US and South Korea say is aimed at protecting against threats from North Korea. However the move has angered China, which says the system can be use to spy on it, and led to a series of economic reprisals. Lotte Group has more than 90 firms in sectors as diverse as beer, hotels, theme parks and chemicals. Since the financial scandal became public, it has already led to the firm pulling out of a share sale worth as much as $4.5bn for its hotel unit. The scandal has also been linked to the apparent suicide of one of the company’s top executives. In August, then Vice Chairman Lee In-won was found dead hours before he was to be questioned in the corruption probe.